Image © DC Entertainment. Written by Tim Seeley, art by Ronan Cliquet, colors by Hi-Fi, letters by Dave Sharpe. My first issue after a large gap, my last one read was #34 due to a glitch in digital delivery. Looks like we have a new writer in Tim Seeley, and though it took me a few pages to figure out what was going on mid-story (this is part 2 of “Ghosts of the Past”), I soon sorted it out and enjoyed the read. GL Jessica Cruz has been sent into some kind of black hole by villainess Singularity Jain. The black hole is threatening other things, and the Justice League is involved, but in this issue the focus is on rescuing Jessica. Her partner, Simon Baz, has captured the culprit, who reveals that Jessica is reliving an event from her past that scarred her deeply, the deaths of some friends on a camping trip. We see some of that in the opening pages and later. With the help of John Constantine, Simon goes inside the black hole to try to find and rescue Jessica, but he must leave his ring behind to do it. This seems like a bad idea…! When he gets there, another prisoner shows up first, a surprising one. 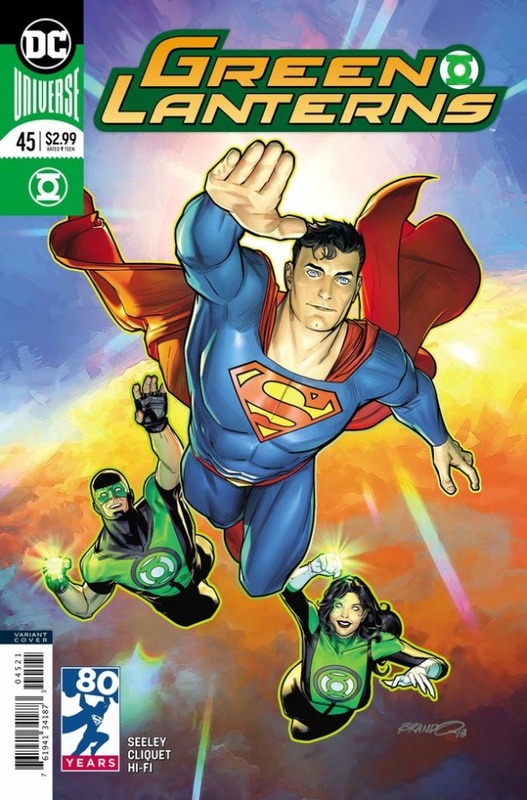 This entry was posted in Comics, Reviews on May 3, 2018 by Todd.